Auto layout has become a crucial tool for iOS and OS X development. It makes creating layout for multiple screen sizes easy peasy. But sometimes it can drive you crazy, with verbose and misleading logs. That’s a huge log! And I cut off the NSLayoutConstraint part. Yet, the second last line is giving a clue in which direction to go to fix this issue. 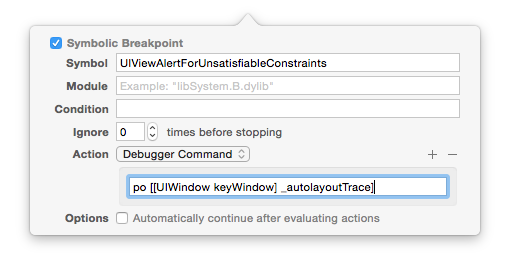 Symbolic breakpoint at UIViewAlertForUnsatisfiableConstraints. Honestly, that won’t help much, because basically it’ll just stop the execution and leave you up with LLDB, alone in the dark. But there’s a little trick you can do to enhance the preceding symbolic breakpoint. Adding po [[UIWindow keyWindow] _autolayoutTrace] to it (for Obj-C projects) or expr -l objc++ -O -- [[UIWindow keyWindow] _autolayoutTrace] (for Swift projects). Now, on console, you’ll see all the UIView hierarchy and exactly where it has ambiguity. Note that as you hit continue it’ll stop at every ambiguous layout you may have. And if that’s not enough for you to find out your autolayout issue, try changing the view’s color, who knows? Fear no more young Padawan, make symbolic breakpoints and LLDB work for you! I would like to thank Porter Hoskins for pointing out the correct LLDB command for Swift.